The musician played continuously. Only 6 people stopped and listened for a short while. About 20 gave money but continued to walk at their normal pace. 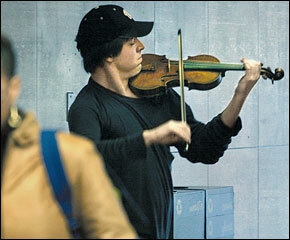 No one knew this, but the violinist was Joshua Bell, one of the greatest musicians in the world. He played one of the most intricate pieces ever written, with a violin worth $3.5 million dollars. Two days earlier, Joshua Bell sold out a theater in Boston where the seats averaged $100.